Robert Eilets - Award winning photographer. Robert Eilets, freelance photographer, began his photo odyssey of Africa fifteen years ago. His love affair with the African continent began on his first trip to West Africa. With camera in hand he began to chronicle the people of Senegal. Since then Robert has crossed the continent in all four directions, visiting more than 23 Countries including the northern mountains of Ethiopia, Egypt, Tanzania, and the Swahili coast. Roberts' photo catalog boast more than 5000 images from these places as well as India, China, Brazil, and the Caribbean. 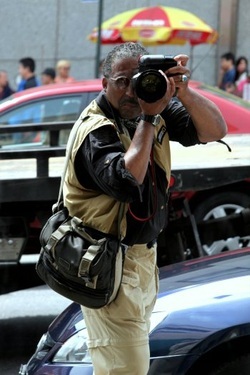 Roberts' images have been featured in an array of periodicals ranging from African Travel Magazine, International Travel News, The Washington Times, Essence Magazine, Ethiopian in Flight Magazine, and Travel World News. Roberts' achievements include receiving the International Library of Photography best photo award in 2000 as well acceptance of the Tanzanian Tourist Boards Media Award for photojournalist for the year 2005. The wonderful photographs you see on skyviewtravel.com have been taken by Robert Eilets.